CORMIX LAUNCHED NEW CONDUR ANCHOR-NEW PACK - Cormix International Limited. Recently, CORMIX INTERNATIONAL LIMITED. 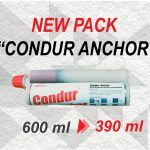 has refreshed and modified CONDUR ANCHOR (High Strength, Moisture Insensitive Anchoring Adhesive) to new pack size 390 ml, CONDUR ANCHOR uses for setting starter bars, dowels, holding down bolts and anchoring in general where a permanent high strength application is required. The new CONDUR ANCHOR has pink colour when mixed. The new pack size was designed to meet customer’s demand and convenient to job site.